Great view from Mount Tomaree at Port Stephens. Cross the sea at low tide to the opposite island called Shark Island. Great view of Mount Tomaree at Port Stephens. There is certainly no shortage of pelicans in Port Stephens. Best of all Lookout overlooking Murwillumbah, Mt Warning (heart of the volcano) and Brunswick Heads in northern part of New South Wales. Australia’s New South Wales has breathtaking beaches and some of the world’s best known cities. The largest and most populous city is the glitzy and fashionable Sydney, with an intoxicating metropolis and scenic natural setting. Spending a little time in Sydney Australia will make you realise what a truly stunning city it really is. While the entire coast of NSW is magnificent, no trip to this part of Australia is complete without a visit to Bondi Beach and the harbour. Brisbane has some of the most mesmerising national parks and forests that are awaiting to be discovered along with this city’s quality beaches. Tip: Download the NSW map to your smartphone as image so you can use it offline whenever you need to. You can find a detailed article about Sydney Australia including a map, lots of pictures and things you can do right soon here. Whale Watching in the entire east coast from Sydney to Cairns (Gold Coast, Hervey Bay, Brisbane, NSW, Sunshine Coast, Cairns, Sydney, Port Stephens, Coffs Harbor, Nelson Bay, Port Macquarie, Byron Bay, Tweed Heads). The best time for whale watching is from May to November, especially in July, September, and October. Our next stop in Sydney is Port Stephens. Compared to Port Macquarie and Coffs Harbour, which are further north, Port Stephens has more to offer in terms of scenery. We especially liked Fingal Split and Mount Tomaree. Mount Tomaree belongs to Tomaree National Park. Within about 45 minutes you can climb the 161 metre high mountain and enjoy a 360 ° degree dream views. From high up, you can also see Fingal Split, a sand spit that connects the Fingal beach (mainland) with Fingal island. At low tide you can walk over this sand spit to the island and look at the lighthouse, for instance. The "crossing" is not without its dangers though, especially when it is stormy so it is not recommended. On Mount Tomaree the remains of the fort's gun emplacements from the Second World War can still be found. The headland played an important role in Australia's defense system during World War II. At that time, the fort included search light stations, a radar tower, torpedo tubes and barracks. In Port Stephens you can also go on a whale watching tour, see dolphins or drive through the sand dunes. Since all these places usually offer the same attractions, if you don't have much time, leave out Port Macquarie and Coffs Harbour or just make a brief stopover. A little detour to Casino is worthwhile for all those who like to see the Australian platypus. In this village there is a bridge over the Richmond River where you can discover the little swimmers. Platypus are especially active at sunrise and sunset so these are the best times to see them. In Woody Head there is a great camping ground on the beach. It is one of the few camping sites on the east coast where open fires are allowed. Each site has a separate fire pit and complimentary firewood is also offered. We recommend that you stay overnight and take a walk the next morning on the beach and explore the area. Our tip: Cook something like the classic Australian damper on the fire pit with a camp oven. You can find everything about a camp oven and damper recipes here. Byron Bay in New South Wales Australia is often referred to as an alternative hippie place where everything is really calm and dignified. There are street musicians on the beach, surfers, alternative shops and "hippies" forming the cityscape here. 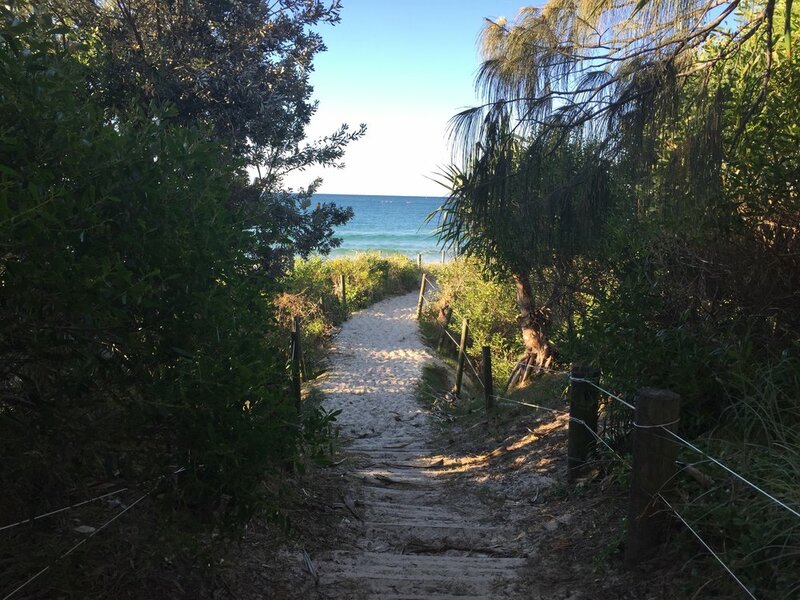 Byron Bay also attracts with its beautiful beaches and coastline. The coastal walk along the beach towards the lighthouse is a must. Not only will you be rewarded with a breathtaking view, but you will also be able to observe the passing whales and dolphins on the easternmost point of NSW Australia. The sunset should be watched from the top of the lighthouse as the golden sun disappears into the ocean. Also in Fingal Bay there is a small lighthouse to discover from which you can enjoy a magnificent view, spot the whales, dolphins and the surfers. Discover sub-tropical rainforest, giant prehistoric pines, waterfalls, natural rock arches, and beautiful lookouts in Springbrook National Park. There is a lot to discover in Springbrook National Park. For those who have up to 1 - 2 days available, we recommend checking out the naturally shaped rock arch called the "Natural Bridge" and a few other lookouts. Natural Bridge is a natural arch created by a waterfall when the underlying cave collapsed. The cave is especially beautiful at night as small green fireflies frolic here. From the parking lot, a 1km circular trail through the rainforest along the giant pine trees will lead to the cave. Depending on how much time you have left, you can either check out the individual lookouts or go hiking. This viewpoint sits on the edge of the cliff and has spectacular views of Murwillumbah, Mt Warning (heart of the volcano) and Brunswick Heads in northern part of New South Wales. The trail is 0.6km long and can be reached in less than 20 minutes. This vantage point is directly on the way to the National Park with a beautiful view of the Gold Coast. From Canyon Lookout, you can see the Gold Coast skyline motorway and a tangle of dense subtropical rainforest (5 minutes away). On each side of the falls there is a viewpoint within 5 minutes from the parking lot. Queensland's capital lies in the middle of Brisbane River and is known for its tropical climate and relaxed lifestyle. In Brisbane there are lots of great restaurants, shops and cultural offer. We especially liked the area around South Banks. There are nice restaurants, cafes and an artificially created beach lagoon for swimming and relaxing. A boat tour along Brisbane River is also recommended. Are you going to travel to Cairns? Then check out our report with great photos, maps and videos soon here. You can check in later, but this must be clarified on the phone beforehand and the amount should already be paid by credit card on the phone. You must leave the campsite by 10 o'clock in the morning. What is the Sydney time zone? Sydney currently has the same time zone as AEST (UTC +10).